My son, Marshall, is today’s guest photographer. He sent me this photo of a sweet potato vine (grown by his dad) that is attempting to take over the world. 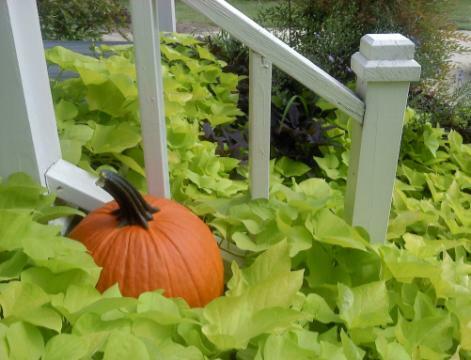 The pumpkin was just placed on the step a few days ago, and the vine is already overtaking it. If that vine continues to grow at this rate (and barring an early frost), the pumpkin will be completely hidden from view by Halloween.